COLOR: Smoked Topaz Swarovski crystals, A-grade natural Citrine and Agate, 14k gold filled spacers, and detachable 24k Gold Vermeil Charm*. Natural gemstones vary in color and all are uniquely beautiful. 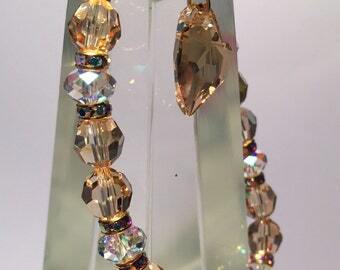 SIZE: Swarovski Crystals are 10mm. Citrine is approximately 12x14mm, Flat Agate rectangles are ~12x16x5mm. Bracelet is available in 7", 8", and 9" linear length. Please allow for depth of beads. Stretch cord for ease. Sizes are approximate due to the variations of the stones. Everything about these Swarovski crystals and coin charm shouts PROSPERITY!! 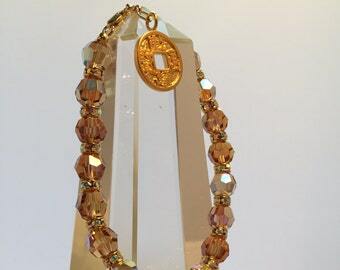 From the high quality citrine and agate stones, topaz Swarovski crystals, gold spacers and detachable Chinese "coin" charm that symbolizes wealth and abundance, everything has been chosen specifically to carry the energies of PROSPERITY & ABUNDANCE. But just the design wasn't enough: all components have also been energetically cleared and infused with sacred energy to become your direct link to the Divine, so that you will continuously receive all the energies of Prosperity & Abundance that you are ready for, and exactly what YOU need. PROSPERITY is being successful at your endeavors - it is thriving in all aspects of your life. It is not solely about financial wealth, which is a limiting belief, but about everything in life. The blessing of this bracelet will help you to discern those places in your life where the you hold limiting beliefs and points of view so that you may release them. Transforming beliefs about prosperity opens the doors to all that the Universe can shower upon you so that you may thrive in all things. ABUNDANCE is a profusion of life - it is all that God can lavish upon you. You have the capacity to receive abundance in everything in life; love, relationships, self-worth, money, creativity, talents and abilities, etc. All things are abundant. This bracelet will assist you in letting go of the judgments and points of views that keep you from allowing God and the Universe to shower you in extravagance. Citrine is commonly known as the Success Stone, Abundance Stone or Merchant’s Stone due to its unique energy. It dispels negative energies, and emits a warm glow that attracts abundance and promotes joy and happiness. It wards off stress, depression and general unhappiness. It is said that it not only promotes success and abundance (especially in business and commerce) but that it helps maintain it as well. It helps us adapt to changes, opens the conscious mind to intuition and directs creative energy into the open mind while boosting confidence and self-esteem. Agate is one of the oldest known good luck stones. It promotes abundance, wealth and good luck, as well as protection, security and safety. 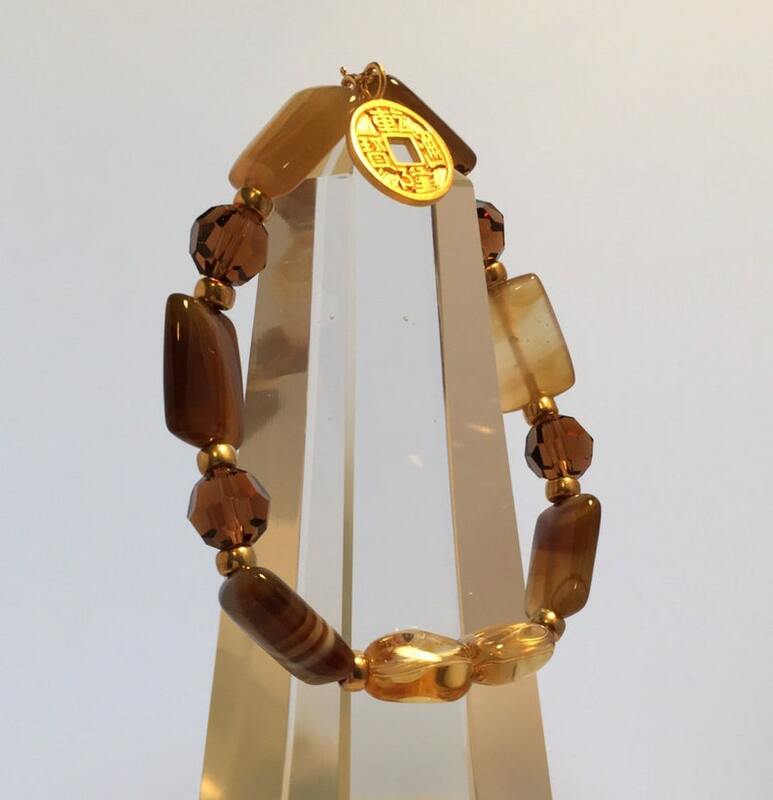 The properties of citrine and agate are a perfect complement to the infused energies of this bracelet to promote prosperity and abundance. The detachable 24k gold vermeil Chinese “coin” symbolizes prosperity and enhances good luck. This bracelet has been programmed to adapt to your individual needs, and will continuously receive unlimited sacred energy, acting as a conduit between you and God. This energy will never "wear out," and the bracelet will not absorb any negative energy, so it never needs to be energetically cleared. If at any time in your journey, you are knowing or sensing that you are not experiencing all that is possible, you can choose in every moment to release the blockages and allow yourself to receive.